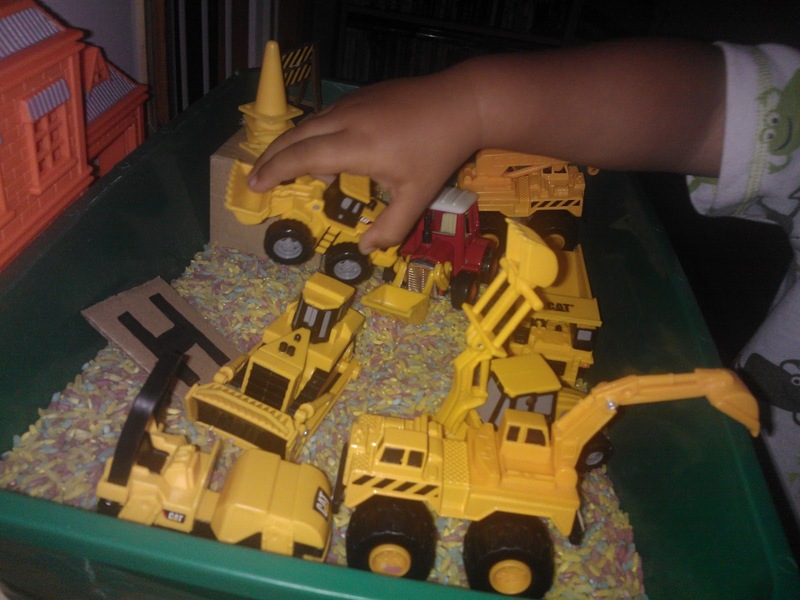 This is Week One in our budget play time using toys around the house or cheap to source to create fun play concepts. This post cost me nothing as had the bits all round the house if you want to backdate the rice cost 40p and the play tray £1 but I must use the rice on average once a week and the tray more often than that! Rainbow Rice- We made this a while ago using happy hooligans recipe. Lil dude got some little plastic planes free with a magazine recently and they are flavour of the month apparently they are a red and green arrow :-) twinned with a very well timed fly over by the real red arrows recently on route to an airshow lil dude is in plane mode soo what better than making an airport for him to play with. Construction consisted of cutting a long strip of cardboard and drawing the lines then cutting to size. I made a small hanger to fit the plane in by folding the same cardboard and sticking down the edges with tape. A couple of squares with H's drawn on the and we were set. 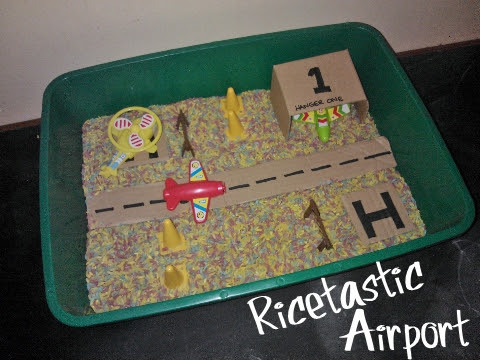 Lil dude had been playing with his rainbow rice that day so I just stuck the bits in the rice added some random cones we have in the toy box and popped the planes and helicopter in. 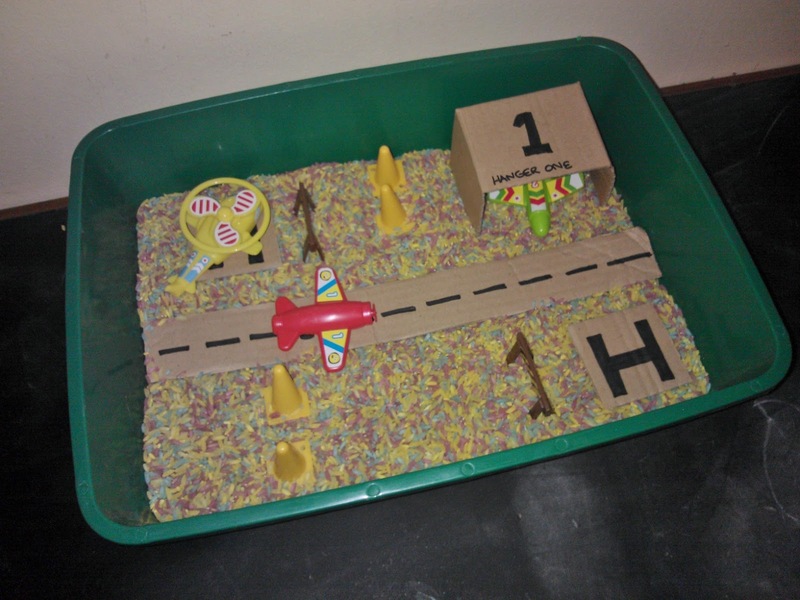 The box we use is a pound land kitty litter box as advised by Happy Hooligans and it gets used "a lot." This may not be the most glam small world but I wanted this blog to be more about affordable play ideas than ones that look stunning but are currently out of my price range. One day I dream of owning every type of toob (yep that's the dream!) but until then budget play ideas is as far as we can get. The Airport needed some work done apparenty so the diggers had to be brought in. I'm yet to create a small world that the dinos or diggers dont get involved in! If you liked this take a look at Hidden Art Station for another budget crafting session.